nice gear but why 2 PRS of the same kind? well... they look the same? same electronics/pickups just that the tonal characteristics of the wood used makes them sound different. the classic comes close to sounding like a strat if i use the "in between" clean settings but i can get great dirty sounds with the HBs while the standard IS basically a Les Paul that can sound like a strat if i wanted it to..
where u guys from? cool gear. it didn't have an overdrive channel but if cranked all the way it breaks apart nicely.. very lush..
so the clean was really great.. reminded me of a fender twin..
and if used with an overdrive pedal like a hotcake or bluesdriver.. the tone! damn it.. the tone! yep...im looking into buying a peavey tube amp. affordability is a plus for peavey. hey vox...u in a band or just hobby? have u tried modified bd2? got a bd2 modded by keeley and at first i hated it but it grew on me and its always what i step on when i want a vintage tone.I tell you man this thing is sweet and very transparent. It can act as a clean booster or to just warm up every transistor amp you plug into and if you couple it with a compressor then its all there.All the tone you can ask for.The bd2 can even sound like a metalzone on very high gain settings and the bd2 is friggin loud.They say it can do things that a KLON can do(a boutique and overhyped od/boost pedal)for a quarter of the price.The BD2 is a very musical pedal. boys and their toys huh?? i modded my ds1 and it sounded great. tight distortion.no more harshness. but overall i still prefer plugging directly to the amp. and use its distortion. in my case the ac-30 doesn't have a gain/OD channel.. just loads of shimmering clean.. but once i crank it to about 5 it starts breaking up.. like shattering glass.. and i did break a lightbulb like that once! all it needs is a nice OD pedal to go crazy! well i'm down to the basics.. guitar, amp and a few effects..
ive already sold much of everything.. cept the peavey 112, fender bass, dlx strat and my drum kit. yeah you won't know what sound you want until you test out a couple of pedals..
too me a while to find my setup but now it's as simple as simple..
still quite a long chain but no more chorus, phaser, compressor, hi-gain boost, flange etc..
i'll check one out.. it's fun trying out new gear! hey pallas, do you buy your stuff from tom lee? or at that 2nd hand place in mong kok? you are in hong kong right? 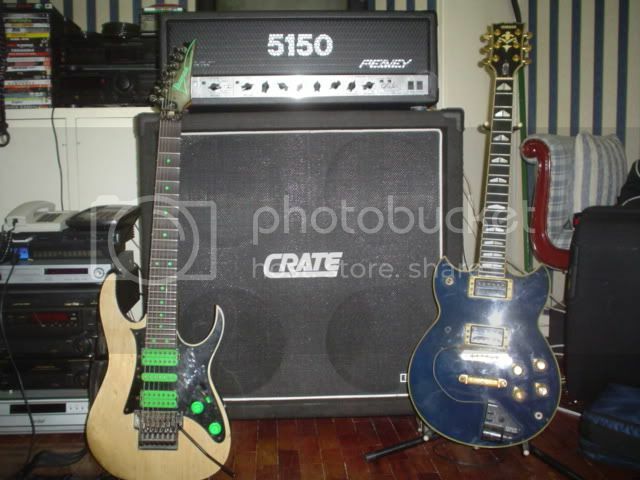 some of my stuff are bought in tom lee and that secondhand store in mongkok is closed.The keeley ones ive bought from the man himself the fuzz natsambahan ko sa baguio and some pedals i traded at harmony central(like the zack wylde od traded with a shredmaster) and the boss stuff well of course their everywhere. ei guys, since pedals n ang pnaguusapan, i just want to ask f u know wer to find a boss MD2 mega distortion or XT2 xtortion. naghahanap kc ako. just wana try it, specially d xt2. ive tried around 20 boss pedals, so far nagustuhan ko lng ay mz2 en df2. habol ko rn kc un rarity ng pedal. dats y dami kong boss pedals for sale ngyon. f ul ask me y boss pedals only...... lang lng i just got used to it. my other effects is a korg pandora px3 and a crybaby gcb95fw. come to think of it.......hmmmmm.... ano p bang mgandang boss pedals?